A large meeting table constructed of snow and ice bears a simplified map of Regina. 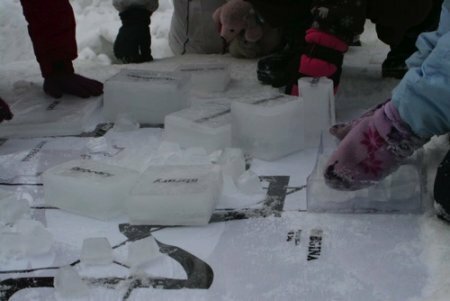 Various city buildings and infrastructure are represented in moveable ice blocks, which participants are invited to place on the map, thus creating their ideal vision of their city. Name of various cities, buildings and infrastructure of Regina. Sponsored by Regina Public Library & Dunlop Art Gallery. This project calls on Regina residents to engage with one another and explore their visions of what their city could become.